Yes , apparently it is an egg and butterless cake !! Oil less too !!! 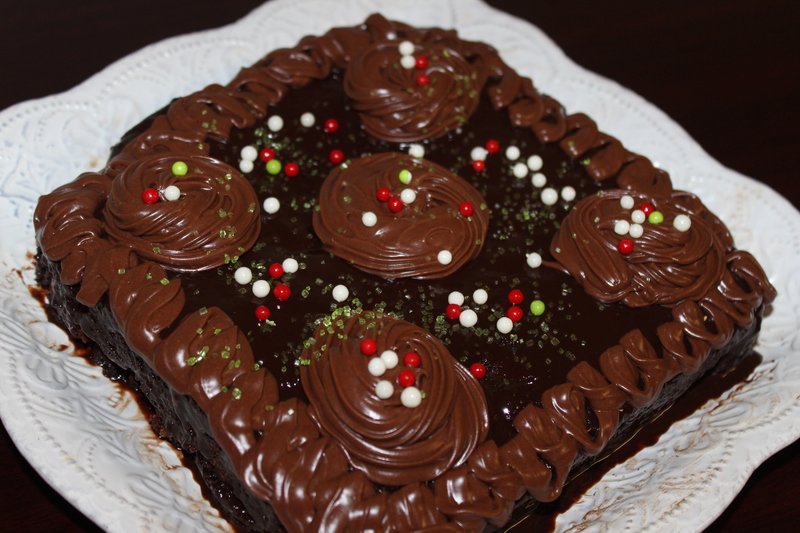 And it is a chocolate mayonnaise cake !! You heard that right !! Mayonnaise !! 😀 Mayonnaise is all about egg , oil and vinegar and that’s why it replaces the addition of extra egg and butter/oil .All these three ingredients of mayonnaise are responsible to make a cake super moist !!! This is the basic Southern style mayonnaise chocolate cake recipe !! I just changed a tiny bit ..
1. Preheat the oven to 350 FH . Grease a 8″ square baking pan and line with parchment paper . 2. Sieve flour , cocoa powder , baking soda and baking powder together . 3. In a bowl put the mayonnaise and caster sugar . Beat with an electric hand beater until fluffy . Add the 1/4th cup liquid milk and vanilla essence , beat . 4. Now add the flour mixture alternately with warm water / brewed coffee in three bathces . Mix very well . You can use the electric beater at lowest speed at the very end just to make sure everythings incorporated well . 5. Pour the mixture into the baking pan and bake for 25-30 minutes or until a toothpick inserted comes out clean . Baking time may vary according to various oven and power system . Heat chocolate chips , butter and heavy cream in the microwave until the chocolates are almost melting !! Around 50 seconds . Don’t try to melt it completely in the oven , that might get burnt . So when the chocolate are almost in melting stage stir gently to melt in completely . Let it cool . Then apply on the cake . After the ganache is set , then apply the chocolate frosting to decorate . Heat butter , chocolate and heavy cream together . Cool down . Then add vanilla essence and icing sugar little by little and beat with the electric beater . Let it set for couple of minutes . I am hoping this is a Bangladeshi food blog. So I’ll go ahead and ask where do I find heavy cream in Dhanmondi?